The world is continuously experiencing the reverberations of the blockchain buzz. With immense scope for speculated and slowly turn into reality, it did not take long for the blockchain estimating as a business of around $20 billion. Once retrospected, it isn’t difficult to gauge that the grand technology has entered the center stage of attraction riding on the wildfire of cryptocurrencies. The world is familiar with the immense opportunities of business blockchains create. The time will unfurl as the adoption of blockchain is finalized at the enterprise environment. The newly acknowledged technology is having the full potential of helping businesses with credit and identity management, immutable transactions, blockchain-based services and a lot more. It is evident from the fact that tech behemoth IBM is deploying 1000 employees and wealth worth $200 million in blockchain based projects. The technology has compelled the mature minds of the industry to reconsider the estimated potential and capabilities of this technology as it has already won the battle of 2018. There is a mixed opinion on how the industry is reacting tog to blockchains. The world considers it to be highly beneficial, but the magnitude of utilizing ability is different in several sectors. The blockchains are used in the high-end logistics and service-based industries. However, they have been already acknowledged in the general manufacturing line and something more than cryptocurrencies. Here are the scintillating predictions which blockchains have induced for the year 2019. Blockchain has been riding a chariot of fame and acceptance because of its sheer capability of ensuring total trust and outright immutability. However, the story flips around itself when one realizes that there are many other applications of blockchain other than distributed ledger and transaction accounting. Rather than taking the straight road, the developers and product analysts are applying the approach of immutability for building applications and also rendering retail services. These commonly include likes of being a trade partner or having an ecosystem which runs on the app. It is not as simple as it might seem to be. Adaption of several technical logics and adoption of the same for the business end goal is a must. With the supreme goal of achieving higher profitability and significant cash flow, a modified model of IOT and big data should be built on blockchains. It is quite an interesting approach which the leading researchers are presently trying to develop. For replicating IoT enabled devices with highly sensitive and real-time working blockchain notes which account for all the data and can also handle the interactive operations from the users. Whether an enterprise application runs over a third party interest application like business 365 or Google Cloud, or it is a native app (native to the company). The complexity of the distributed system based on blockchain increases when the site components several functionalities. These include the likes of the identity management system, HR management system, workflow, user management, and even mediation come into the picture. The leaders in software development quite confidently predict that 2019 will witness events growth and maturity of deciding components which are used and developed on a spine called Blockchain. While building side chain components on the blockchain architecture, the reliability and robustness of the functionalities is a matter of concern. However, what burns the metal is making sidechain components integrate into the blockchain architecture. The safety and the robustness of the features is a matter of concern but what matters is its interfacing and compatibility with others. For instance, there is one side chain components, a user management system which profiles their accounts, keeps track of their activity, record their interaction with the computer and also accounts for their business. Furthermore, there is an HR management system which has all the relevant details of unemployed, maintained their attendance through the store and also tracks their annual appraisal. 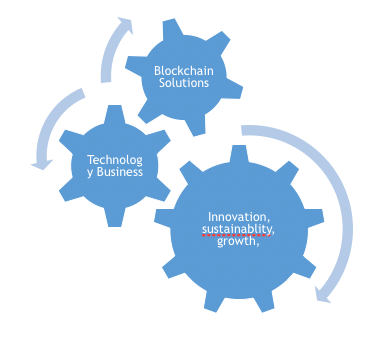 The greatest challenge lies in an outright integration of both of these side chain components. It would be highly utilizable if the user management system has some integrated capabilities of tracking and employees’ activity. Further accounting for their appraisal depending upon whatever they do with their computers. This sort of a cohesive system can be of immense use for all industries. Single-handed use of any virgin technology is useful, but the level of utilized ability increases manifolds when India’s go-ahead directly supported by another substantial technology within the architecture. For instance, consider a smart logistics industry network consisting of humans, wearable technology devices and sensor-enabled IoT devices. These can work pretty well and can help the business grow and be automated single-handedly. However, one can use blockchains for approval and management of transactions of all the items, articles and the back and requirements can increase the capability and performance of the system exponentially. Similarly, when blockchains get their support from artificial intelligence, there can be a highly capable substitute of artificial neural networks. It can be easily substituted with a proper adaptation of a set of blockchain nodes. Great job.I like your theme. The information you give will be of great value to me, I hope.Thanks for sharing so much valuable information. This will definitely help me out.. Best regards.